The Arab world is slowly but surely rising its head in the startup ecosystem. And India seems a hot target for them. Cocoon Venture’s managing director and cofounder is Nebu K Abraham. Their corpus size is 15-20 million dollars until 2018 and is actively looking to utilize it. Their first international exhibition was held in Bangalore and had the support of NASSCOM 10k startups. What should we should know about Cocoon? Cocoon Ventures is a team of tech enthusiasts, businessmen and like minded investors mostly from the gulf region inspired by our vision for empowerment, mobilizing dynamic and novel startups. At Cocoon Ventures, our panel mostly consists of veterans and business professionals and entrepreneurs who have shared in every part of the struggle to build businesses from scratch. We share in every bit of the emotion with those we partner with. We follow a hands down approach and aspires to work hand in hand as team steering through bottle neck together. Because we know the value and the structural importance in every business, we offer more than just capital. We offer our hand other areas like market penetration, networking and forming strategic partnerships to growth hacking and mentoring. What about India interests Cocoon? There is no doubt that India has a lot of untapped potential. The country is very vibrant. Good talent here is in abundance. For those in search of business opportunities, India will not disappoint you. When it comes to the Indian startup ecosystem, it’s the third best in the world, which means that the investor and business policies are quite inviting. The Indian startup ecosystem is one that has grabbed investor attention in the global platform, primarily because of the disruptive solutions the startups are bringing to the world table. This is one reason why Cocoon Ventures decided to do its first international event in Bengaluru. And the response has been nothing less than inspiring. This journey has been such an amazing experience for all of us at Cocoon Ventures. Areas/sectors of interest to invest in? Cocoon Venture has been very fond of investing in the area of technology (IT, wearable, robotics). Apart from the tech industry, we are interested in retail, IoT and ecommerce. Cocoon Ventures is not afraid to venture out to other industrial segments in search of novel business models and innovations. We are just as excited to invest in a wide spectrum of industries other than the ones mentioned above. Size of fund? Is it one big fund for investing across the world or is there a specific fund dedicated to each region? We work quite in a different model but we are looking to actively utilize about about 15 - 20 million dollar size for the years 2016 – 2018. We have not made a focus to any specific regions as we are open to mostly any part of the world, with a little more focus on the Asian region. 5 notable startups invested in and/or mentored? Markat, an ecommerce platform from the gulf region; 7NODES from India, a design and app development agency; Tanweer Technology Management from Saudi Arabia, a technology management company; HashMyBag based in India/Dubai, a unique B2C interactive/ecommerce mobile app; Cocoon Nest, from the gulf region, a global crowd funding platform to be released soon. What startups has Cocoon been pleasantly surprised by? We made our entry into the Indian market via our global initiative, World StartUp Expo (WSE 2016), where we were excited to see many awesome ideas, to name a few PluckFresh, Hug Innovations, FluxGen, Kidobotics, and 366 Brewing Company to name a few. 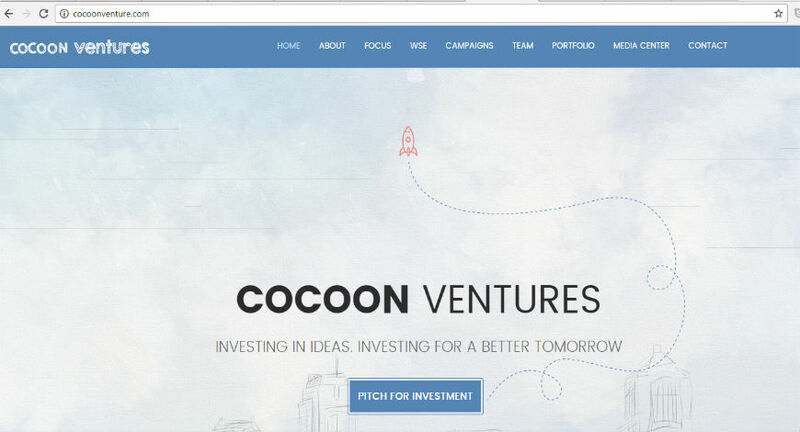 What startups has Cocoon been not so pleasantly surprised by? We received an overwhelming response for WSE 2016; something we did not expect as this is our very first international event. Almost all of the startups on display showed off a product or service that was distinct and unique. Some of their challenging ideas and innovative solutions took us by surprise. However, through the event we were able to witness for ourselves the versatility and the distinctive concept realizations of different startups. This was nothing short of a pleasant experience for us. Cocoon prefers a single founder or a cofounder team? Cocoon Ventures likes to work with a team that has clarity of thought and a vision. Having said that there have been instances where teams have succeeded commendably and some have failed. Essentially we are not looking for the number in the team but one that knows what they are doing and how they are going to achieve their goals. How many startups would you typically like to have in the Cocoon portfolio? For now we would like to not limit ourselves to any specific number but remain open to opportunities. However, we would be looking at least 20 – 25 novel startups with a sustainable business model and a well thought out roadmap for the future. Looking for more startups to invest in at the moment or absolutely no more room for more startups? We are certainly looking for more startups and investment opportunity. Though we are a Dubai based venture capital firm, we would love to explore more opportunities in the Indian startup ecosystem. Like I have said earlier there is lots of untapped potential and scope for disruptive ideas and innovations. Also because we would like to expand our presence in India too. All or any of the above. We would like to make ourselves more accessible to entrepreneurs and startups looking for opportunities, hence all our coordinates are mentioned in our website. With that said, heading to office directly would require you to email us the agenda or get in touch with us through phone first; and then carry it forward to an official meeting.